I am using the Date Reservation Widget and the calendar keeps blocking days. I only have weekends blocked in settings. Please advise. Dates are still blocked and grayed out with these settings. The WEEKENDS are all disabled, just like how you want it to. And the rest of the WEEKDAYS are available. The 15th, 22nd and 26th are disabled because someone already picked those slots. If you're seeing the widget differently, kindly share a screenshot of it. Please refer to the quick guide below to ensure that your screenshot will reach our Support Forum. It will never post if you attach it via email. Oh ok. I wasn't aware of the fact that dates would become unavailable for selection once they're chosen and submitted. I'm using the widget for a time-off request form for employees. 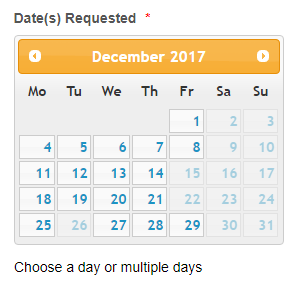 We allow multiple people to request the same day. In that case you should try another widget. I have a demo that shows them all on the one page. So you can try them all quickly and then decide which one you like best.